Several target connectors can be installed on the circuit board to access an ARM target system. You can physically plug in units, such as J-Link or J-Trace, to program, debug, and trace hardware systems. 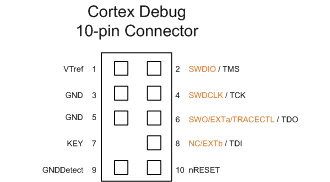 This 10-pin Cortex Debug connector offers ITM and DWT trace information. Two pins (SWD) are used for debugging, where one bi-directional pin (SWDIO) is used to transfer the information and the second pin (SWDCLK) is used for the clock. A third pin (SWO) delivers the trace data at minimum system cost. The Serial Wire and JTAG pins are shared. Position 7 has no pin and serves only as a key to properly orient the connector. The 10-pin connector is a Samtec 10-pin: FTSH-105-01-L-DV-007-K connector. It's dimensions are: 0.25" x 0.188" (6.35mm x 4.78mm). 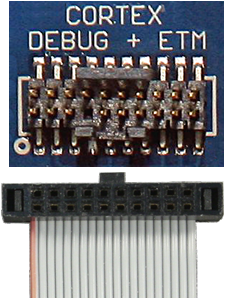 This connector offer debug features, ITM and DWT trace data, as well as ETM instruction trace. ETM signals are output on additional four pins (TRACEDATA). A fifth pin is used for the trace clock (TRACECLK). 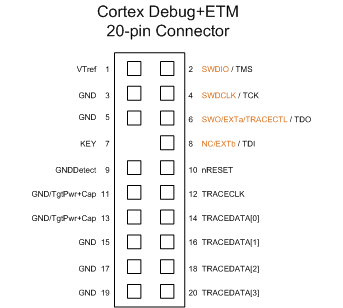 This way, ETM can be used in either SW or JTAG mode. This connector is a super set of the 10-pin Cortex Debug connector. The first 10 pins on both connectors are identical. Pin 7 is keyed and is removed from the connector. The 20-pin connector is a Samtec 20-pin: FTSH-110-01-L-DV-007-K connector. It's dimensions are: 0.50" x 0.188" (12.70mm x 4.78mm). 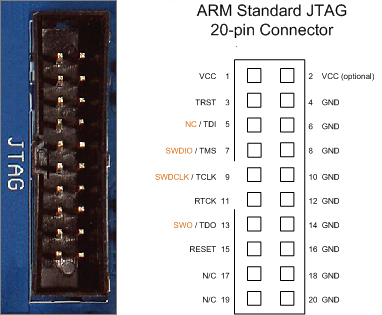 This JTAG connector delivers the same functionalities as the 10-pin Cortex Debug connector. The header (e.g. a Samtec TST-110-01-L-D) is a 20-Pin, 0.10" (2.54 mm) pitch connector with these these dimensions: 1.3" x 0.365" (33 mm x 9.27mm).